Welcome to San Diego Comic-Con Week! It’s the biggest week in comics, and I’m excited for all the news and trailers and awesomeness bound to arrive this weekend! 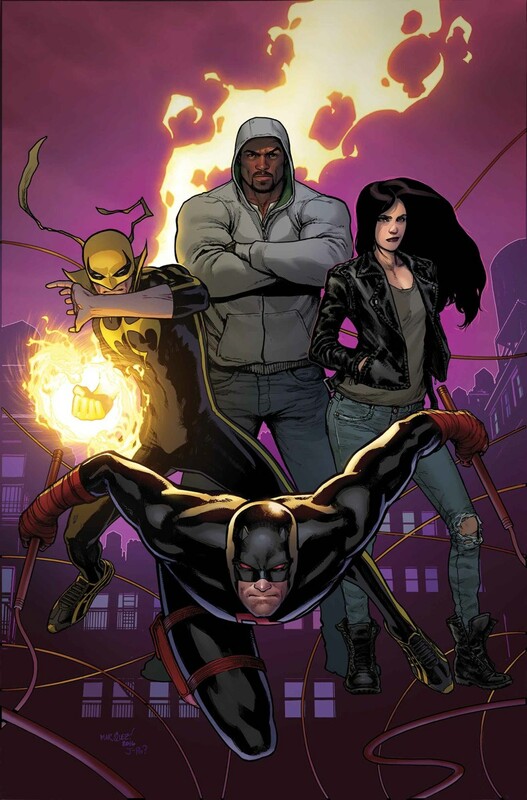 An expected highlight this year will be The Defenders from Marvel! They’ve got a new comic book, a new action figure line and their Netflix show arrives in one month! I can’t wait! As has become a tradition here at Henchman-4-Hire, I like to spend Comic-Con Week playing fantasy superhero draft. Superhero team rosters change all the time. Every new X-Men reboot results in several different team lineups. The Avengers or New Avengers or Champions are always changing! This year, I’m going to pitch you my Defenders lineup. If Marvel hired me to write a Defenders comic, these are the characters I’d put on the team! In the past, I’ve dreamed up rosters for the Avengers, the Justice League, the Fantastic Four, the Teen Titans, the X-Men, X-Force and the Sinister Six! Good news, everyone! 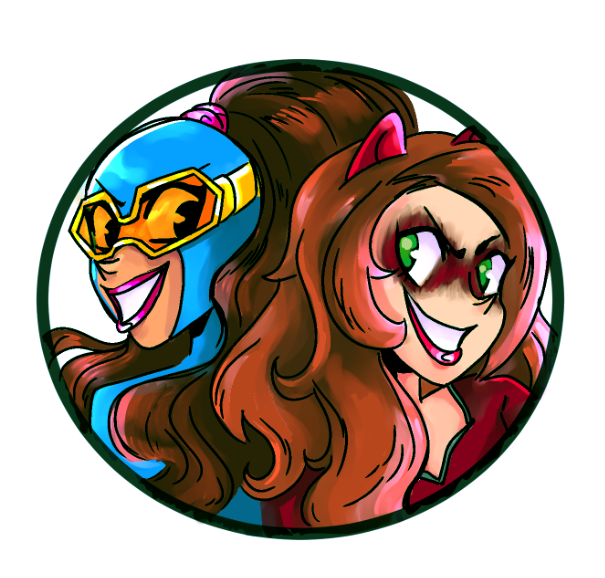 The Gamer Girl & Vixen graphic novel is here! Almost! my partner, the great and glorious Kristi McDowell, picked up the comics at the shipping depot on Friday, and she said they look amazing! I’ll be heading down to her place soon to start packaging them and shipping them out to our Kickstarter backers. If you’d like to order your own copy, stay tuned to this blog for details! Meanwhile, regular comic book companies keep putting out books. Unfortunately, I’m kinda busy at my day job his week, so I had to trim some of my usual reviews, like Hulk. Fortunately, there were still some goodies! The final issue of Patsy Walker a.k.a. 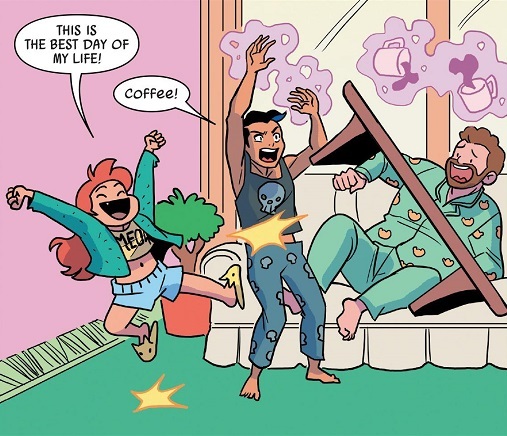 Hellcat is Comic Book of the Week because it went out like we all hoped it would: adorably. Double meanwhile, after only two issues, I’ve already decided to drop both Weapon X and X-Men Gold. The former is fine, I just don’t care about it. But I am finding X-Men Gold to be actively bad. There’s no cohesion in the comic. Events and scenes aren’t held together by any real foundation, and seem to exist solely to make for ‘kewl’ moments. Plot points are nonsensical and lacking in logic. And the art, of course, is terrible. Comic Reviews: Detective Comics #955, The Flash #21, Infamous Iron Man #7, Patsy Walker a.k.a. Hellcat #17 and X-Men Blue #2. It’s Iron Fist weekend! Unfortunately, I don’t think Marvel released their new Iron Fist comic yet, so I don’t get that special sort of synergy. But while you’re reading these reviews, you best believe I’m binging some quality Netflix Defenders. Fortunately, this week had some spectacular comics regardless, with new issues of Ms. Marvel, Harley Quinn, Hellcat and The Wild Storm! I also tried out the first issue of the new Batwoman series, and I’m considering getting back into Amazing Spider-Man! 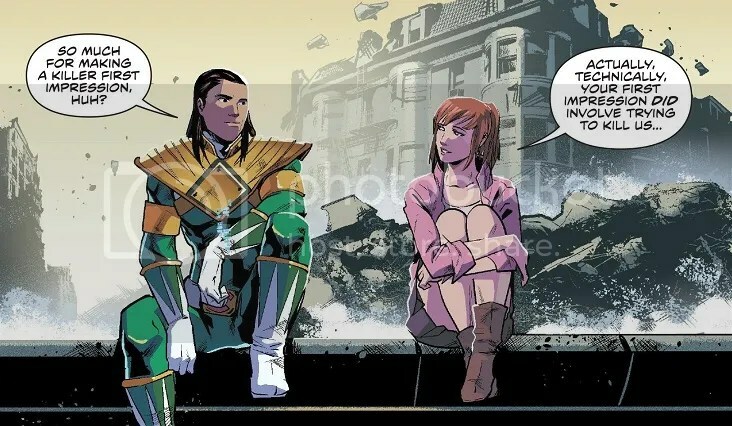 Comic Book of the Week goes to the latest issue of Mighty Morphin Power Rangers, which is telling some pretty stellar stories! 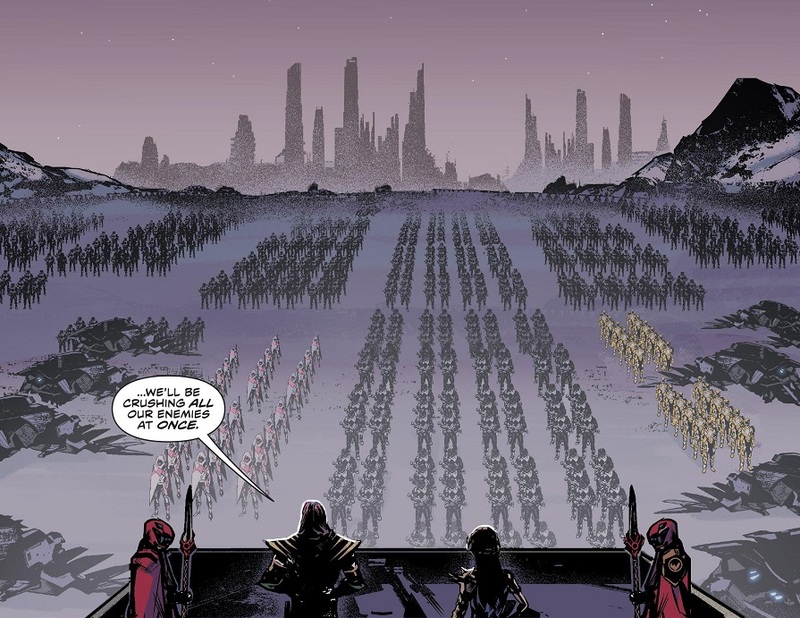 Let us hope that next week’s movie can live up to the quality of the comic. Meanwhile, I’ve been catching up on Tom King’s Batman, and it seems like I gave up on that series too soon. After the opening story, which I just didn’t like, King has been doing some amazing work with Bane, Catwoman, the Ventriloquist and more! I might have to add that back to my review pile. Comic Reviews: Amazing Spider-Man #25, Batwoman #1, Harley Quinn #16, Mighty Morphin Power Rangers #13, Ms. Marvel #16, Patsy Walker a.k.a. Hellcat #16 and The Wild Storm #2. By the time you’re reading this, I’ll be manning my own table at the Fingerlakes Comic-Con in my hometown of Auburn, NY! It’s a 3-day event and I’ll be there all three days promoting my own comic, Gamer Girl & Vixen! There will be some big GG&V news coming soon, but for now, I’m spreading the good word at a hopefully awesome convention! As for the rest of comics this week, it was another good one! We’ve got Harley Quinn, we’ve got U.S.Avengers and we’ve got Power Rangers, among others! Comic Book of the Week goes to the new issue of Patsy Walker a.k.a. Hellcat! Because it’s just adorable and funny, that’s why. This week in comics I read but didn’t review, I’m taking a slight break from The Mighty Thor. It was still a fun issue — because Jason Aaron is great on the title — but it further solidifies my belief that this Asgard/Shi’ar War is a weird waste of time. We’ll get back to Mighty Thor when that wraps up. And I really enjoyed the new issue of Nightwing, until writer Tim Seeley teased a possible fridging! I’m going to give Seeley the benefit of the doubt and see what the next issue holds, but for now, he’s on notice! Comic Reviews: Harley Quinn #14, Mighty Morphin Power Rangers #12, Patsy Walker a.k.a. Hellcat #15, U.S.Avengers #3 and The Wild Storm #1. This was a banner week for comics. I grabbed a whole pile, read a whole bunch, and largely enjoyed myself. Comics are a fun medium, with lots of good stories, great characters all manner of adventure. And this week was especially good, with new issues of All-New Wolverine, Luke Cage & Iron Fist, Patsy Walker and even Mighty Thor; talk about a handful of favorites! But Comic Book of the Week has to go to the new issue of Mighty Morphin’ Power Rangers from BOOM! Studios! This comic is tapping into every single one of my nostalgic veins, and I can’t stand it sometimes. ‘Member Megazord? ‘Member Green Ranger? I ‘member Green Ranger! ‘Member Dragonzord? Yeah! I also picked up the latest issue of Civil War II, but this series is just a mess. There’s no real character depth, no real rivalry or focus. This is possibly the flimsiest Big Event I’ve read in a good long while. It’s all just nonsense, and I’m glad I dropped it quick. The Night of the Monster Men event running through the Batman comics is shaping up to be pretty cool, though. I didn’t bother reviewing the issues, but they’re fun nonetheless. Comic Reviews: All-New Wolverine #12, Astonishing Ant-Man #12, Harley Quinn #4, Mighty Morphin’ Power Rangers #7, Mighty Thor #11, Patsy Walker a.k.a. Hellcat #10 and Power Man & Iron Fist #8.